Adding a section to your model in SkyCiv Beam will allow you to view stress results for your beam. In the previous example for ‘Building Your Model’, we inputed the values in directly. Click the ‘Use Section Builder’ button to instead define your section graphically. 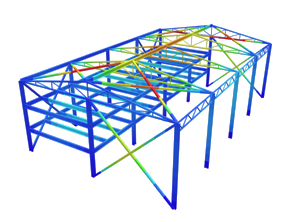 The Section Builder is a full featured software in itself which allows you to dimension and create custom sections for your beams. There is a whole section dedicated to explaining all the features of Section Builder, however this section will briefly cover what the Section Builder can do. Templates – Add a template section and modify the dimensions. Database – Use one of our many international catalogs to select a section. Custom – Create a custom section that does not exist in the templates or the database. MyLibrary – Save, load, and delete any previous sections for future use. Note that built up sections, and sections with holes and cutouts can also be specified. Select ‘I-beam’, and click the ‘Add’ button. Click the I-beam, and click the ‘General’ tab. The default material will be Structural Steel – the material properties can be changed, however for this example leave them as they are. 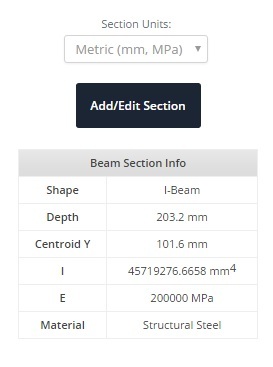 Clicking the ‘Dimensions’ tab will allow you to change the dimensions – however for this example, just use the default dimensions for the I-beam. Click the ‘Submit’ button when finished. After the section has been submitted, notice that the table to the right of your model will become populated with information about your section.